Gray wall on tomatoes, also called blotchy ripening, is a not a disease or the result of a pest infestation. Rather it’s a physiological condition associated with environmental factors. The condition affects tomato fruit during the ripening process. Stems and leaves do not show symptoms. Tomatoes look splotchy, mottled or unevenly ripened. 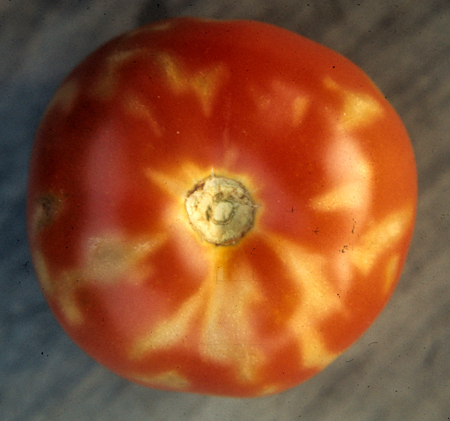 Outward grayish splotches on tomato surfaces may even collapse inward – thus the condition’s name. The inside of an affected tomato may also have grayish, yellowish, brownish, or greenish patches. When does it affect my tomatoes? Blotchly ripening develops most often on green tomatoes during the ripening process. Varieties which are susceptible to tomato mosaic virus are also more likely to exhibit symptoms. Several environmental factors can contribute. Weather conditions. Extreme heat, high humidity, and fluctuating temperatures stress plants. Shade. Overcast skies during hot weather, fog, clouds, and excessive foliage promote uneven ripening. Excessive nitrogen. Nitrogen stimulates leaf growth. Tomato plants that have been over-fertilized or have been fertilized with a product high in nitrogen produce too many leaves. The extra leaves shade ripening fruit, contributing to the problem. Often low potassium and low boron promote to uneven ripening, too. Overly wet soil can also contribute to inconsistent ripening. Tomatoes affected by gray wall exhibit symptoms on fruit alone. Tomato mosaic virus causes mottling and spotting on both fruit and foliage. Test your soil each year and amend nutrients accordingly. Use a balanced tomato fertilizer – one does not have excessive nitrogen and also has adequate potassium. Plant varieties that are resistant to tomato mosaic virus.